Looking over an old powerpoint file from Viscotek, an interesting slide on a unique application stood out. 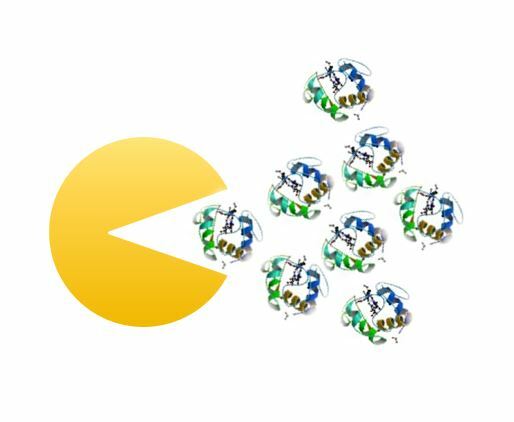 Investigating samples of the 20S Proteasome by light scattering in conjunction with refractive index RI was able to clearly determine whether a particular sample contained ‘filled or empty’ proteasomes. In that case, both the empty and the loaded proteasome showed an RI peak at the same elution volume. Thus with conventional calibration, one would have had to conclude that these samples had the same molecular weight. 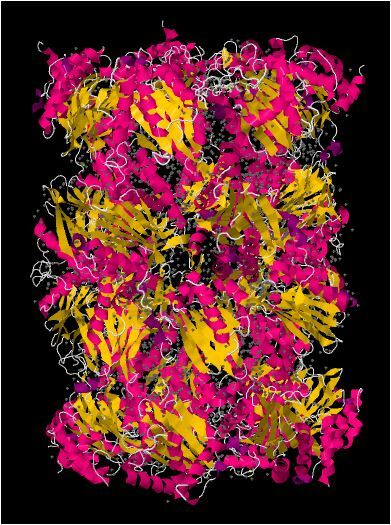 However light scattering revealed that the filled proteasome had a molecular weight of 791 kDa v ersus the empty proteasome molecular weight of 695 kDa. The additional protein consisted of an unknown number of Cytochrome C, which has a monomeric molecular weight of 12 kDa. 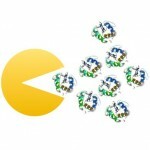 How many Cytochrome C in the complex? 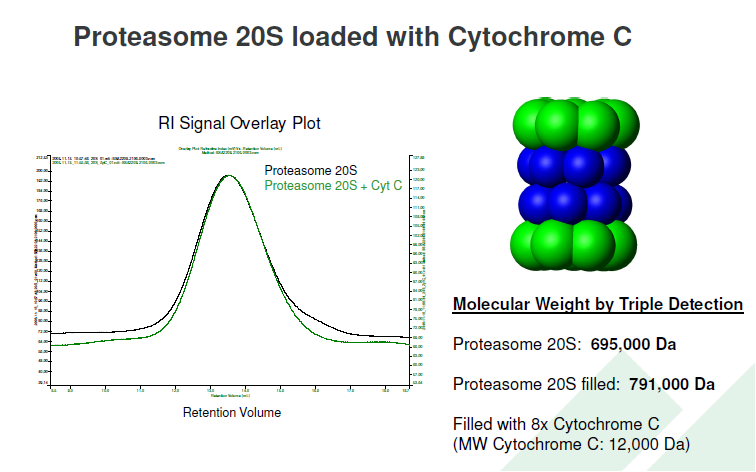 The difference in MW between the ’empty’ and ‘filled’ proteasome 20S must be due to the presence of Cytochrome C molecules forming part of the complex. Thus 791kDa – 695kDa = 96kDa is due to Cytochrome C, and this difference corresponds to 96kDa/12kDa = 8 Cytochrome C, evidencing the presence of 8 CytchromeC molecules in the proteasome-cytochrome complex. Light scattering therefore provided insight into the structure of this particular complex that conventional detection with RI or UV alone would not have been able to accomplish.